So many Instagram accounts, so little time. Maybe you’re managing profiles for different locations. Perhaps you want a hybrid presence for your business and personal accounts alike. Either way, the need for multiple Instagram accounts is growing for brands both big and small. And sure, recent Instagram features which allow you to hop between up to five accounts interchangeably are a nice touch. But they aren’t the be-all, end-all of your multi-pronged Instagram presence. There’s a lot more involved, but it’s worth the effort. Looking at the likes of Target, Kraft and Adidas, it’s clear that major brands have gained huge followings just by expanding their reach via multiple accounts. But even given the opportunity to manage multiple Instagram accounts, how can smaller brands take advantage of more handles among their audience? After all, too many accounts could spread some business’ follower counts thin. However, there are ways to implement more than one account without taking away engagement opportunities from others. First thing’s first, though. 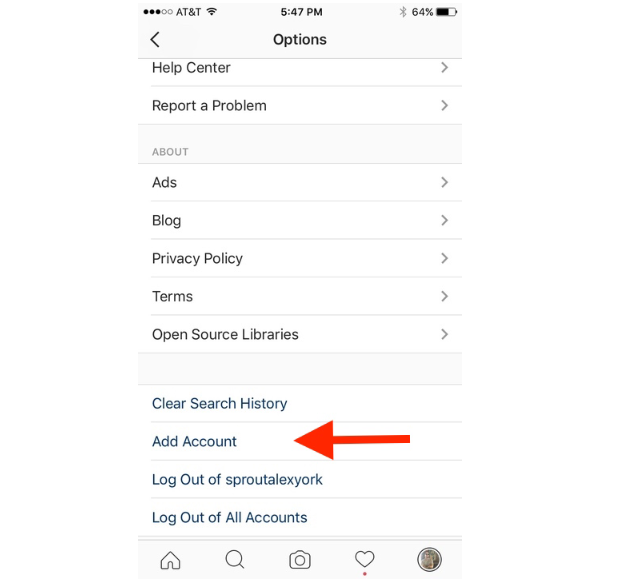 Let’s quickly look at how you actually add multiple Instagram accounts to your mobile device. Multiple Instagram accounts can be managed all within a single device by simply adding another profile. Click on your profile and look for the sun icon (iPhone) or three vertical dots (Android) on the top right. Once in the settings menu, scroll to the bottom and simply click Add Account. At the login screen, enter your username and password for the account you’re adding. Repeat the process if you want to add another account. When you have your Instagram accounts connected, simply go to your profile to switch between users. There you can tap on the username at the top of the screen to easily switch between your different accounts. For those who have push notifications on, Instagram will notify you with followers and like updates with the account in brackets. Brands today understand the power of Instagram and how critical it is to engage, monitor and track followers. With more than 800 million monthly active users and millions of pieces of content uploaded daily, Instagram turned into the network of choice for visual marketers. And through tracking hashtags, geolocations, comments and likes, brands gain an in-depth view of their marketing opportunities. Yet one of the biggest nagging problems is Instagram’s API, which prevents third-party tools from commenting outside the native platform. Additionally, brands need access to Instagram data to see what’s working and what needs some fine-tuning. Manual data collection is tiresome and time-consuming, and many third-party platforms provide little-to-no data outside of new followers. 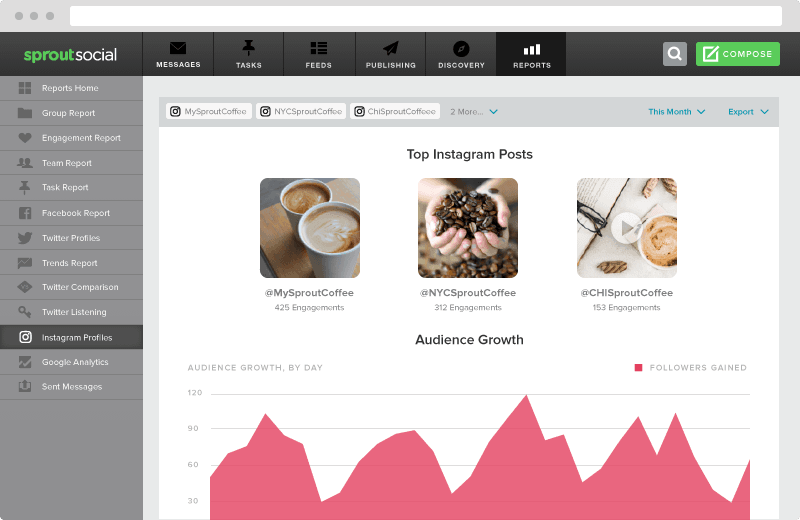 But with Instagram analytics tools from Sprout Social, your brand can dig deeper into the social data of each account. Sprout provides follower metrics to show monthly increases (or decreases) by percentage. You can also track points like publishing behavior to see how many Instagram posts you’ve delivered in a certain time frame. We even break down each metric into photos and videos to give your brand a clearer picture of how your Instagram accounts are performing. For those in the ecommerce space, multiple accounts signal major opportunities and risks alike. Because if you split your audience or try to frequently move them to a new account, you’ll lose engagement and interest immediately. Here’s some food for thought: a Shopify report discovered Instagram had the second-highest average order value compared to other social media platforms. With an average order of $65, Instagram beat out Pinterest ($58.95), Facebook ($55) and Twitter ($46.29). Instagram makes it easier for brands to showcase their products to social shoppers, which means you have to be active and engage your audience on all accounts. At the same time, you also need a clear purchasing experience. For starters, you can’t have each account direct followers to the same landing or buying page. Try to get hyper-focused with your links to get customers where they want to go. Instagram only allows one link in your Instagram bio, so always be ready to update and change across all accounts. 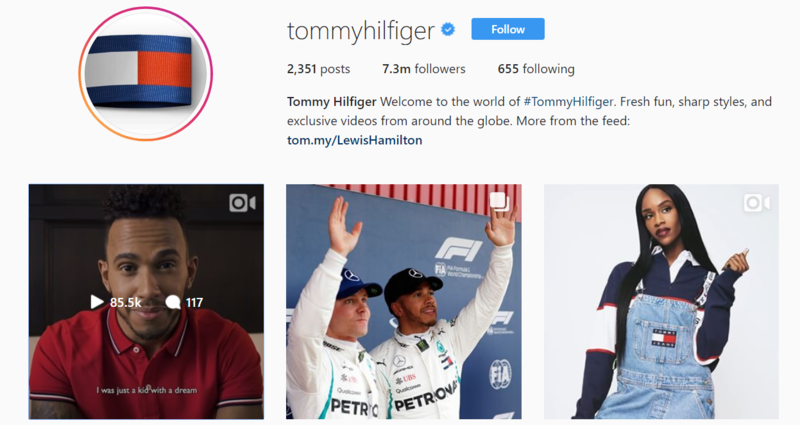 Brands like Tommy Hilfiger update their bio links frequently to coincide with whatever promotion they might be running. This not only keeps their feed feeling fresh, but also gives followers something new to check out beyond the realm of Instagram. 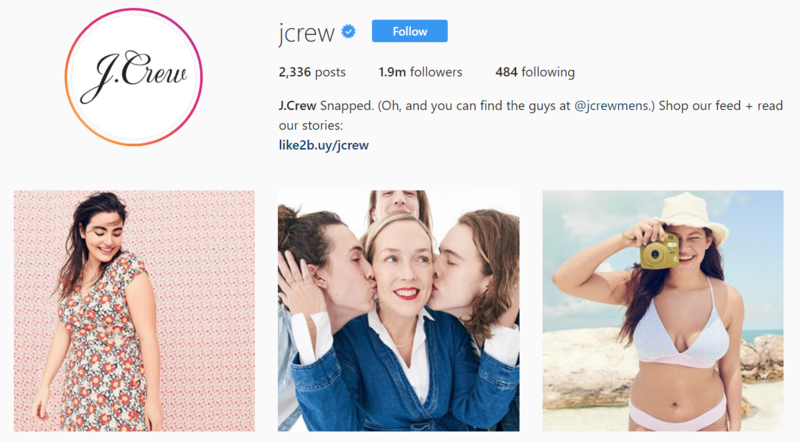 You’ll also notice that ecommerce giants like TopShop make a point to direct all of their followers to a specific, shoppable Instagram page. This definitely beats pointing people to a generic product page or your homepage. By highlighting the link in their bio, shoppers know exactly where to go to find the fits they just saw. You need to put as few clicks or taps between your product and checkout pages as possible. With multiple Instagram accounts, you create a more direct avenue for shoppers to buy. According to Recode, users typically spend between 24 and 32 minutes per day on the platform which beats out the likes of Twitter and Snapchat. In short, people aren’t afraid to put in the hours to scroll through their Instagram feeds. That’s why crafting unique content in terms of images and captions is so important for multiple accounts. Ideally, you can align your different accounts with different verticals of your business. For example, Target has an independent Instagram account specifically for home and fashion content. While the company sells much more, Target gets granular with Target Style to showcase the fashion and design aspect of their brand. This ultimately allows Target to address a certain audience demographic that shops at their stores without running the risk of publishing too much fashion and apparel visuals. Another example is the J. 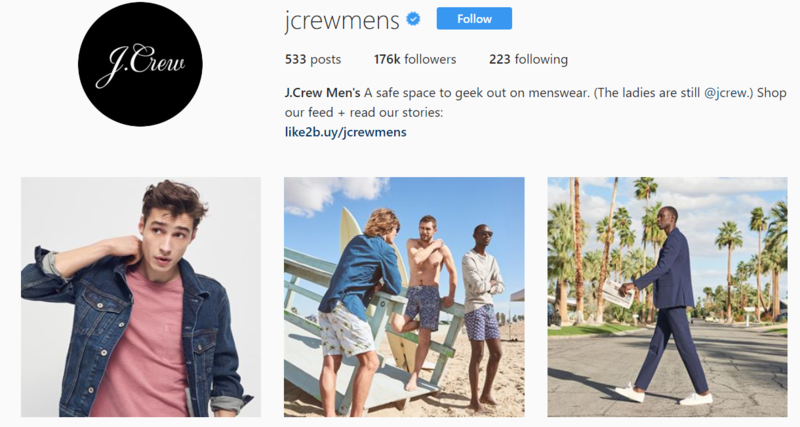 Crew Instagram which markets itself as “ladies only,” although the store carries clothes for both sexes. That said, the brand understands that the overwhelming majority of their followers are female. That’s why they have a dedicated account for menswear (@jcrewmens). Meanwhile, both accounts reference in each other in their bios and represent the same business. Another reason for creating multiple Instagram accounts might be geography. As such, geo-specific content is likely to perform well as evidenced by Samsung’s UK account. Focusing specifically on exploring the UK and neighboring countries, this account offers a totally different vibe than the main Samsung account which primarily promotes smartphones. And whether you’re a small or enterprise-level business, Instagram has the power to engage, build brand awareness and push customers further down your marketing funnel. Because so many businesses still hesitate to adopt the app, you have a chance to get ahead in the Instagram marketing game. As a marketer, your goal should be to exist where your audience is located. More likely than not, you have a large portion of your audience who are hooked on Instagram already. Additionally, brands are still in the infant stages of adopting multiple Instagram accounts. It’s true that managing just one presence can be a source of stress for a single social media or community manager. That’s why you should invite managers to give Sprout Social a spin to manage all your Instagram, Twitter, Facebook and LinkedIn accounts in a single Smart Inbox. Many tools limit you to a single platform, but with Sprout, you can take on your entire social media presence and get ahead of your competition with in-depth analysis and easy-to-use social media tools. Now, there’s no denying that creating content is time-consuming. Snagging snapshots. Crafting captions. The works. So while you should publish unique content across your multiple Instagram accounts, also try to be time-efficient by double-dipping when it makes sense. What are we talking about? Well, let’s say you have a killer piece of content or something that’s blowing up on one of your accounts. If you want to get even more mileage out of it, why not post it to your second or third account if it’s relevant? Check out this high-performing post from Nintendo of America. A slight variant of this picture was published a week earlier with a different caption on the Nintendo UK account. Your Instagram accounts aren’t going to burst into flames if you publish the same pieces of content from time to time across them. Just don’t overdo it. The key to effectively managing multiple Instagram accounts is having a specific content schedule. This allows you to plan ahead in terms of what you post to fill up your posting calendar. Likewise, you can clearly see firsthand how to switch up your captions, hashtags and then double-dip where appropriate. Brands like Tito’s Vodka are totally consistent when it comes to what they post and how often, which is a recipe for an engaged following. Meanwhile, the brand is also responsible for the popular Vodka for Dog People account which boasts the same photo with a uniquely tailored caption. This is a brilliant example of both repurposing a piece of content and avoiding repetitive posts via Instagram. The ability to schedule Instagram posts is a total game changer for busy brands. Especially for agencies working with multiple clients and customers, the ability to see the big picture of your social presences in one place is a huge stress reliever. Unlike Facebook where content can easily be hidden by an algorithm, photos on Instagram are much harder to miss. Once you get users to follow your brand, they physically have to scroll through your visuals to get to the next image in their feed. This means your images or videos have higher engagement rates because users’ screens are completely filled with your content and you’re more than likely to at least look at the image before moving on. Marketers have a huge opportunity to use this screen space creatively. We mentioned the importance of unique content, but it’s also critical to provide visuals that stand out. According to our Instagram best practices infographic, 93% of buyers agreed visual appearance is the primary reason for their purchase. Visual data is simply easier to digest. Provide beautiful content that relates to your business or that shows some sort of resolve. For example, if your product saves users time and money, use a beautiful image of an apartment filled with luxury items (fancy bike, expensive laptop, art, etc.) and a cup of coffee. Along with managing multiple Instagram accounts, you have to set goals for each handle. Increase Instagram engagement: When you’re able to put all your incoming Instagram comments in a single inbox, you can measure your engagement more efficiently. It takes just one click to reply to anyone or any of your collective Instagram accounts. Collaborate on social profiles: If you put effort into your social media team, you likely have more than one person who will access these social accounts. With Sprout, you can easily manage multiple Instagram accounts with your coworkers through the Smart Inbox. Your collaboration efforts allow you to create or assign tasks, mark messages as complete and even alert other users with real-time notifications when someone else is viewing or replying to a message. Divvy the workload: If your Instagram followers have questions about your product or services, you might want to send their question to your customer support or sales team. Through Sprout, you can assign any message to better work as a team, divvy the workload and ensure every incoming message gets the right attention. Keeping a pulse on the social discussion about your brand is essential for marketers. Knowing what customers say about you helps you reach and engage with your audience. That’s why monitoring your Instagram hashtags can play a huge role in your engagement strategies. 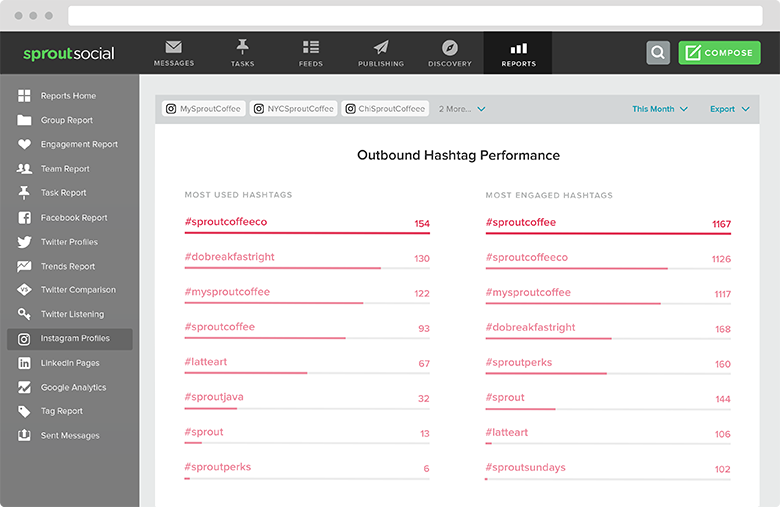 With Sprout’s keyword search tool, you can monitor hashtags on Instagram to see what common words are associated with your brand. Additionally, you can monitor geo-locations as well so you know where your customers and audience are located. Having this information helps you make better marketing decisions with your social channels. It also can show you how well your social campaigns have paid off. Should You Merge Instagram Accounts? Of course, there’s the other side of the coin when it comes to multiple accounts. That is, it might be time to merge Instagram accounts for those who are either spread thin or have multiple underperforming accounts. For example, let’s say you have a primary account that’s booming while the other is gathering cobwebs. In this case, it probably makes sense to spend the bulk of your time and energy on a single account. Not only does this mean a more efficient use of your time, but just flat out looks better to outsiders versus having an account with little to no activity. Announcing your move in a series of images and captions, eventually counting down to a final day with an image that tells followers where to go. Including the link to your primary account in the bio of your secondary accounts. Manually following back active users on your secondary account using your primary account, ensuring they know for a fact that you’ve moved elsewhere. Are Using Your Multiple Instagram Accounts Effectively? Instagram is a staple of marketers both big and small, especially for those pushing out visual content. With multiple accounts on deck, you can expand your reach and grow your following exponentially. And if you want or have multiple Instagram accounts already, you shouldn’t waste time managing both through the native platform. With Sprout Social, you can change your Instagram efforts into a solid tool for generating leads and building your audience. Try us today with a free 30-day trial!